Clematis Montana 'Broughton Star' (Clematis Montana 'Broughton Star'): growing, planting, caring. A cultivar with a spectacular bloom in the spring, in a multitude of deep-pink small flowers. This variety of spring clematis blooms in May-June. It forms double flowers with pink petals tinged with white. Its leaves are composed of three lanceolate leaflets. The clematis appreciates to have its head in the sun and its foot in the shade, facing South or West. Plant in late autumn or winter, in unfrozen soil, during the dormancy of the plant. Plant in a hole at least twice as big as the root ball. Soak the roots in water before planting, it should improve the chances of recovery. Keep a hollow around the base, it will serve as a water reserve during the first months. Tamp the soil well around the roots (do not hesitate to use all your bodyweight). Water until the hollow is full, and the level decreases very slowly (at least two watering cans). Clematis prefers to have shade at their base, shelter it with a flat tile Also cover the base with a small mound of soil, which will promote the emission of shoots from the stump. 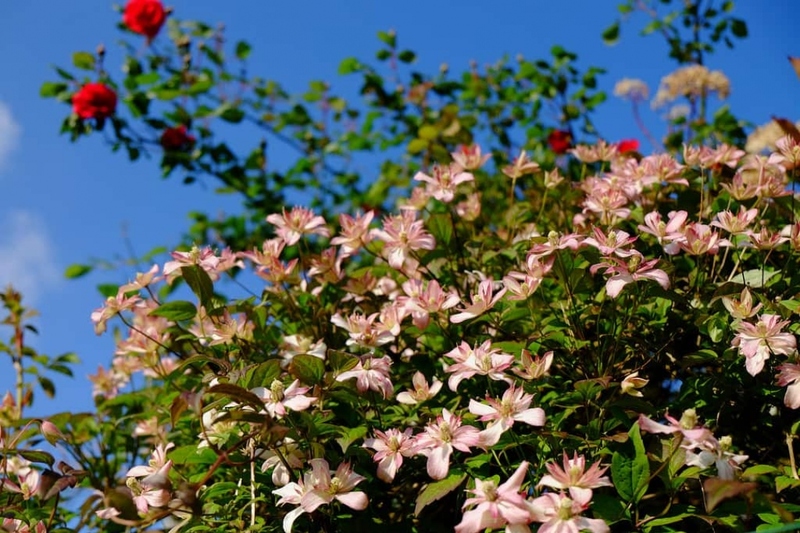 Provide the clematis with a small support pole to bring it to its final support. Clematis easily reaches 5 m despite a regular trimming, so use a sturdy support. Prune - if you feel invaded - after flowering. Remove dead or damaged stems, and shorten others if necessary to promote branching. Water twice a week if you have planted early in season during the first month, and possibly all summer in case of drought. Some varieties bloom very early, in this case they do not need watering during flowering - but as early as May, watering can be useful. Water copiously but infrequently to encourage the root system to seek water deep underground. It's therefore suitable to water until the planting basin is full and only empties slowly. Mulch the clematis to limit the challenge of "weeds", and evaporation. Spraying a layer of 5-10 cm mulch of bark or wood is recommended. Mulch you clematis with compost or well-decomposed manure in February or March.